“Virginia Is for Lovers” may be emblazoned on some of the commonwealth’s license plates, but the truth is that family vacations always have been the mainstay of tourism for the state. That said, in the past couple of years, the commonwealth’s motto has become truer than it used to be. More couples without children, including many millennials, are now booking stays at the state’s resorts. “Generation X and Y are spending as much on luxury travel as baby boomers,” says Janet Kurtz of Keswick Hall of her experience as director of sales and marketing for the Charlottesville resort. Visitors of all ages and marital statuses make Virginia tourism a growth industry. They spent $21.2 billion in 2012 (the most recent year for which figures were available), a 4 percent increase over the previous year. Caroline Gibson, director of corporate communications for Virginia Tourism, says the industry supported 221,000 jobs in 2012 and generated $1.36 billion in local and state taxes. Virginia’s rich history and great outdoors remain its primary attractions, but three trends among visitors also have meant major contributions to the commonwealth’s coffers. Have an intense interest in food and drink. Farm-to-table dining, wineries and craft breweries have morphed into major draws. “Virginia has become a destination for the sophisticated culinary traveler,” Gibson says. “Craft beer and farm-to-table are as popular as champagne and caviar these days,” says Patt Burnette, marketing manager for Charlottesville’s Boar’s Head Inn. Value fitness and wellness. A bigger focus on healthy activities takes many, disparate forms in the commonwealth, from a desire to hurtle down a 900-foot zip line at 40 miles per hours at Wintergreen Resort in Nelson County to getting horizontal for a lomi-lomi massage at Kingsmill Resort in Williamsburg. Want one-of-a-kind experiences. At Keswick Hall, guests can shoot clay pigeons or walk foxhounds with the Keswick Hunt Club. “They want something to make a memory of,” says marketing director Kurtz. Other resorts strive hard to offer unique outings. 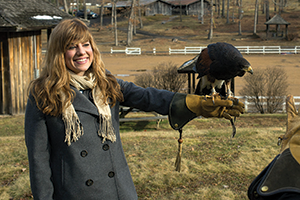 At the Omni Homestead in Hot Springs, for example, guests can take falconry lessons. At Salamander Resort in Middleburg, they can ride bikes at sunset through horse country, and at the Tides Inn in Irvington, they can go crabbing or do paddleboard yoga. At Airlie in Warrenton, they can take a lesson on organic gardening, while at the Boar’s Head Inn in Charlottesville, they can take a hot air balloon ride from the front lawn. Some of Virginia’s premiere destinations are providing other new amenities, too. The venerable, 573-acre Boar’s Head Inn has expanded its package deals to include more winery tours, cooking classes, individualized sports lessons and lavish spa treatments. Its clients, particularly the younger ones, put such a premium on staying in touch that the inn now has free Wi-Fi and recently upgraded its download and upload speeds. “IT is always trying to keep up,” says marketing manager Burnette. At Keswick Hall, the big news is the opening later this summer of the Pete Dye-redesigned, 18-hole golf course. It will present “a challenge for the advanced golfer and give more novice players a fair game,” says Kurtz. Most tourists to the commonwealth continue to come from the mid-Atlantic region, Gibson says, but Kurtz expects the new golf course to draw international travelers, as well. 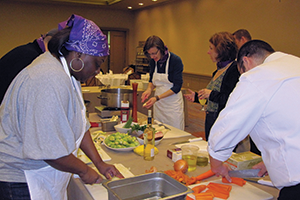 Like other resorts, Lansdowne is offering more culinary-centric events, such as chili cook-offs and cupcake challenges. For loco-vores, it has added beehives to produce its own honey and provide attendant learning opportunities for guests. Like the Boar’s Head Inn, the Northern Virginia resort has upgraded to unlimited free connectivity and increased bandwidth throughout the resort. “Fifty percent of our guests search on mobile devices,” says sales and marketing director Snapkoski, so Lansdowne markets itself heavily through social media outlets such as Facebook and LinkedIn and alerts guests to special activities with text messages. For the first time in 30 years, Mountain Lake Lodge in Pembroke became a year-round resort last year. “We were sold out at New Year’s,” says general manager Heidi Stone, who says wintertime guests can snowshoe and cross-country ski through the 2,600-acre nature preserve in the mountains of Southwest Virginia. New to the lodge is Treetops Adventures. These aerial courses feature rope bridges, zip lines, tightropes, Tarzan swings and log walks. That may be true, but another mountain resort that has always been an oasis of scenic serenity — where cell phones can’t get a signal and rooms have no land lines — found that its guests might want peace and quiet, but only to a point. “Everyone wants to get away and unplug,” says Ryan Kasperski, who handles publicity for the resort, “but at the end of the day people want to connect.” Yes, even Peaks of Otter in Bedford now has free Wi-Fi.